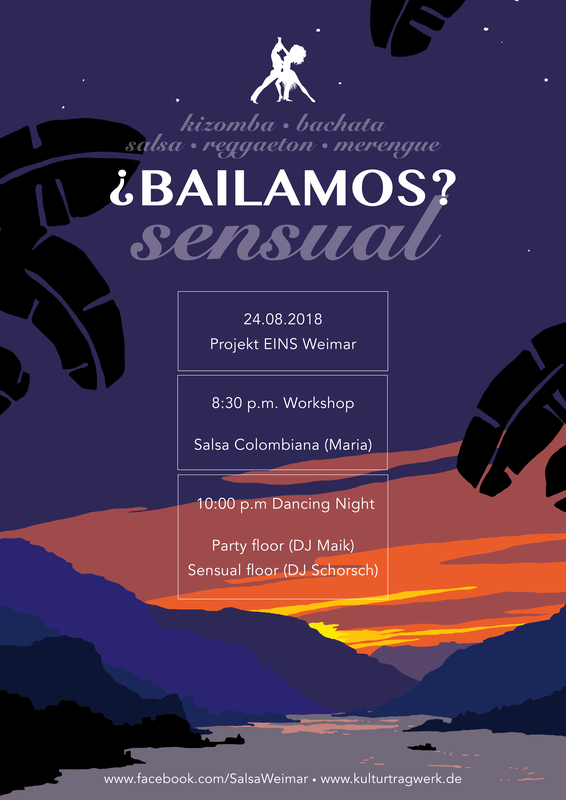 Um euch nicht zu lange im Sommer ohne Salsa, Bachata und Kizomba darben zu lassen, veranstalten wir am Freitag, dem 24.08., die dritte Veranstaltung der Reihe ¿Bailamos? im Projekt Eins Weimar. Wir starten wie immer mit einem Workshop und im Anschluss findet die Party statt. Kommt dazu und genießt die Musik. Not to let you starving during the summer without salsa, bachata and kizomba we are going to host Friday the 24th of August the third event of the series ¿Bailamos? in Projekt Eins Weimar. We'll start with a workshop as always and continue with the party. Join us and enjoy the music. This entry was posted on Montag, August 20th, 2018 at 15:37	and is filed under Kizomba, Salsa, Veranstaltungen. You can follow any responses to this entry through the RSS 2.0 feed. You can leave a response, or trackback from your own site.